A Year of Cross-Cultural Culinary Encounters — and a Giveaway! East Bay Ethnic Eats happily celebrates its first birthday. In the past year, this blog has provided me a ticket to explore my passion: the intersection of food and culture. 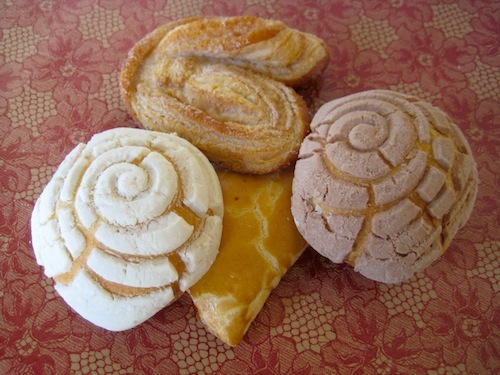 With this forum to share my discoveries, I let my curiosity lead me on little local expeditions to examine the layers of meaning behind our daily bread (or naan, tortillas, injera, pan dulce). Thanks to all my supportive readers for joining me on the journey and for your words of encouragement. As a small thank-you, one of you will receive a book that exemplifies this quest for the stories behind what we cook and eat, Grace Young’s The Wisdom of the Chinese Kitchen. More about this giveaway in a moment. First, a small re-cap: I began this year with an intimate focus, searching the East Bay for the best fish taco, falafel and halvah. I also investigated lucky foods from around the world and highlighted some local treasures, including Oasis’ freshly made filo dough and Gum Kuo’s 20 kinds of jook. Along the way, what I found most satisfying was getting to know people from other lands, whose stories of their immigration journeys — when seen through a food lens — shed special light on some universal themes of loss, identity, comfort and adaptation. Not surprisingly, I discovered that the food-ways of one’s homeland are not only meaningful to immigrants; they often serve as the portal through which members of the second-generation begin to explore and reclaim their cultural heritage. I have been fortunate to meet some intriguing individuals who have generously shared their experiences with me. I met Jane Lin when she presented at an event on food and healing sponsored by the Asian Culinary Forum. The former urban planner changed her life course when, after the birth of her two children, her mother came over and made her traditional Chinese soups for the “period of confinement” – the first 30 days after giving birth. These nourishing soups inspired Jane to immerse herself in this aspect of her culinary culture. She now makes these healing soups for other new mothers under the name Mama Tong. Jane was kind enough to let me follow her around on a shopping trip in Chinatown (for an upcoming Oakland Magazine article) and graciously invited me over while she cooked a couple of these classic soups. 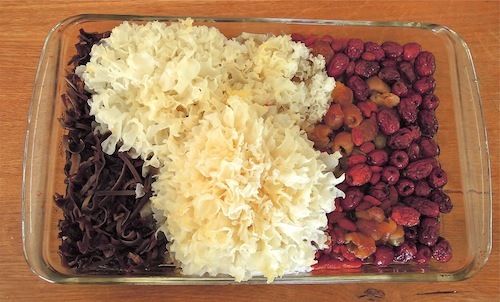 I watched her prepare a pork and black rice vinegar soup using pig “trotters” and a black chicken soup containing several dried ingredients renown for their healing properties (red dates, longan, goji berries, wood ears, and snow fungus). 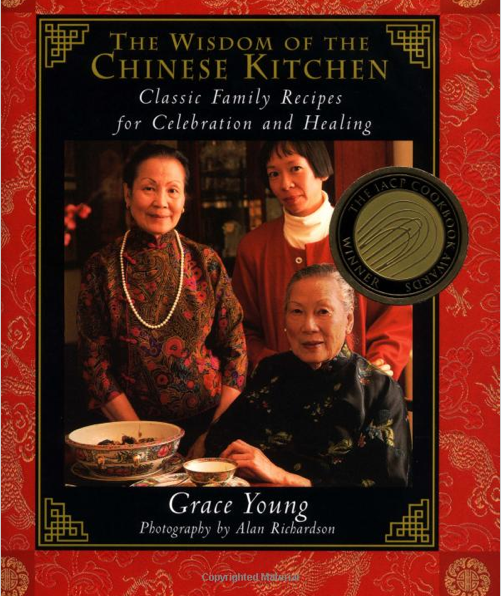 Resonating with a similar theme, two weeks ago, I attended the Greenbrier Symposium for Professional Food Writers and was delighted to meet Grace Young, one of the presenters and author of several widely respected books on Chinese cuisine. Grace is known as the “poet laureate of the wok” and has traveled the world to collect stories and recipes from members of the Chinese diaspora from India to Trinidad. Her first book, The Wisdom of the Chinese Kitchen, is a tribute to her family’s culinary nurturing and also includes many recipes for dishes that promote “optimum well-being.” Her poignant stories and clear explanations are like having a knowledgeable, kindly aunt at your side in the kitchen. I look forward to cooking my way through Grace’s books, gaining personal and collective knowledge, plus a wealth of delicious dining experiences. Describe a meal or dish from another culture that provided you with a new perspective? What’s your illuminating food memory? This entry was posted in Chinese food, Uncategorized and tagged Asian Culinary Forum, Chinese healing foods, Grace Young, Greenbrier Symposium for Professional Food Writers, Jane Lin, Mama Tong, period of confinement. Bookmark the permalink. 12 Responses to A Year of Cross-Cultural Culinary Encounters — and a Giveaway! Thought I’m not all that widely travelled (e.g., my niece sampled duck fetuses in Vietnam) I have several memories that include the importance of simplicity, economy, and enjoying what is available in the region. Many years ago, on my first trip to Europe with my sister and two other of her friends, we visited Tours in the Loire Valley and found a tiny “mère et père” restaurant. The sweet elderly couple who owned the establishment prided themselves on their homemade rillettes, which they served as first course of our prix fixe dinner. My three traveling companions sampled, but had a hard time stomaching the room-temperature well-cooked pork soaked in and covered by its congealed fat, so left nearly their entire portions on their plates. I couldn’t bear disappointing the owners by leaving full plates of their house speciality, so ended up eating four full portions of the rillettes. I was grateful for the long walk back to our room that evening to work off the heaps of rillettes I’d consumed, but I was even more grateful to have been able to say farewell to the lovely restaurant owners, and to have left them beaming because “our table” had so obviously enjoyed their rillettes. Part of the experience contains a reminder that so many cultures are so much better than we Americans at making purposeful use of all parts of the critter, or vegetable, or whatever ingredient. In Bermuda, I learned that the traditional “fish stew” used all parts of the fish (head, including eyeballs, but possibly not the scales or bladder) making for a rich, flavorful stew base. 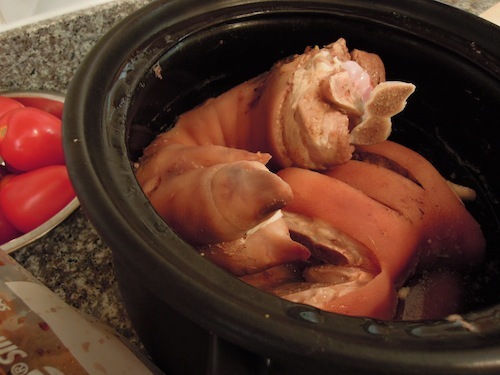 During the winter months of my youth, I watched my mom make soup stock from chicken or turkey carcasses or beef bones left from our Sunday roast. She then would use the stock to make fragrant, delicious, comforting vegetable soups. When she added homemade bread, I could smell the combined aromas all the way from the end of our long driveway. After a two-mile-plus walk home from school, my freezing feet and fingers, and the rest of me, nearly melted into the kitchen to enjoy a simply perfect family meal. My memory is of the time I spent in Marrakech’s Jemaa el Fna, eating sheep’s head with bread and no other utensils while sitting next to Moroccan locals. It was then that I realized food is one of the tried and true ways to really get to know another culture. Here I was, experiencing something that was completely different to me, while in a few stalls over other tourists were eating French fries and vegetable kebabs instead. They didn’t know what they were missing. Japanese osechi. I LOVE that the dishes are so GORGEOUS, perfect, beautiful, colorful, elegant. They are sooooo tasty, and such a variety of savory and sweet. I LOVE that the women of the house make the osechi together, like a cooking party. And, mostly, I LOVE that we eat osechi for days, not cooking over the new year’s holidays but munching on gorgeous, tasty eats that have been lovingly prepared and stored in gorgeus laquer boxes. The new perspective? Before osechi, I had never realized you could eat well for days and not cook or eat out. ANYTHING is possible! I consider myself to have a pretty well rounded and experienced palate, but one thing that changed my mouth was my first experience with southern food. I went to a chicken and waffles restaurant in Oakland with my best friends, who had all tasted the wonders of southern food before. They found it hilarious when I took my first bite of fried chicken with waffles and syrup, they said it was the look on face. I knew that my meal was probably the suggested calorie intake for 3 days, but I didn’t care. It was like comforting, delicious fried sweet heaven in my mouth. Even though I’ve only had chicken and waffles once, I knew it was a monumental moment for me. That meal changed my perception of food because I know a sweet fried heaven is out there waiting for me when I want it. I prefer my fruit in the end stage of ripeness. For example, I don’t like green bananas; neither do I want them mushy, but I welcome brown spots on the peel. I changed my mind a year or two ago in a VietNamese/Thai Restaurant local to where I live in the San Fernando Valley of Southern California. My adult son who has traveled extensively talked me into sharing a dish. The green papaya salad was served with a base of shredded crunchy, chewy raw papaya topped with grilled and delicately flavored shrimp. It has become a favorite of mine – a raw, green fruit after all . . .
For me, it was the first time eating Ethiopian food. The idea of eating with my hands was exciting but something I was raised to avoid, so trying a meal where using my hands was a big part of the experience opened up a whole new world for me! Getting my fingers into the thick, soupy dishes, using injera to soak up the savory sauces while little rivulets of spicy oil ran down my fingers and soaked the napkin in my lap was so, so satisfying. The spongy texture of the flatbread is still one of my favorite touch sensations, especially as it’s wrapped around a handful of hot kik alicha. Almost 40 years ago when I lived in Gollu, Sierra Leone, West Africa, my husband and I were presented with a chunk of “beef”. The jellied red glob was still warm from the recent slaughter. We decided it would be best to grind it up into “hamburger” since its look was not quite familiar to us. Using our hand meat grinder (we lived without electricity or running water) the glob began turning into mush. It took a moment before we realized we had been presented with an entire cow’s liver – a high honor in the Mende culture. We halted the grinding and, instead, cut it into cubes and cooked it in a broth using our propane stove. It turned out to be the most delicious liver I have ever eaten. The strong taste found in the packaged liver we buy at home was missing. I learned then just how incredible it is to eat meat so fresh. The kerosene refrigerator in our mud and stick house was a boon as it allowed us to savor the delicious liver meal for many days afterwards. The first time I prepared an Indian curry from scratch, I realized I could cook a world of cuisine. It’s opened up my palette and my search for new recipes. There’s nothing I can’t make with a little time (and sometimes searching hard for the ingredients). The most memorable meal I’ve ever eaten consisted of one bite, and it’s a meal I’ll never repeat. The setting: A dark, moonless night, in the open air cooking room of a fellow Peace Corps Volunteer. Light emanated from the small fire underneath a skillet frying a piece of meat. I could barely see what was in the pan but its shape was vaguely unsettling. It reminded me somewhat of a chicken wing in that it had a bent joint connecting two distinct parts of the cut. Overall though, it was much larger than a chicken wing. The lower half of the meat was about six inches long and slender, while the top was four inches and fat; the joint connecting the two was at a 150 degree angle. “What does that remind me of?” I kept thinking to myself as my friend, refusing to identify the meat, sliced me off a chunk. I popped it into my mouth and began chewing. It was tough, thoroughly overcooked and not terribly tasty. I continued to chew as my friend stood there grinning. Just as I was about to swallow, he shined a flashlight into the corner of the cooking room. The light fell upon the butchered carcass of a small monkey missing its left arm. Suddenly it dawned on me. The shape in the pan was a small forearm attached to a bicep. Instantly, my mind jumped to thoughts of the Donner Party and the Uruguayan soccer team, groups who had had to resort to cannibalism for survival. To me, eating monkey was simply too close to cannibalism. I couldn’t do it; I couldn’t swallow. I spat the piece out on the ground where it was quickly consumed by a nearby dog. My friend was highly amused. So much for culinary enlightenment. What great stories! I appreciate the time you all took to write them and glad that my question prompted these rich food memories. A couple of themes I noticed: several of you mentioned a new perspective that “anything is possible” after you ate a certain food or different way. And it seems that challenging ourselves with novel foods also is enlightening (e.g.,sheep’s head, fish eyeballs and warm fresh liver). For the give-away, I used the very scientific method of putting all your names in a hat (really a paper bag) and picking a winner. So the book Wisdom of the Chinese Kitchen will go to Christine.